This article was first published in 2002 and updated in 2008 and 2016. At its first publication it was the object of unauthorised translations, something quite common 15 years ago when the notion of copyright was not much respected. This translation of the updated 2016 version has been authorised by the author. 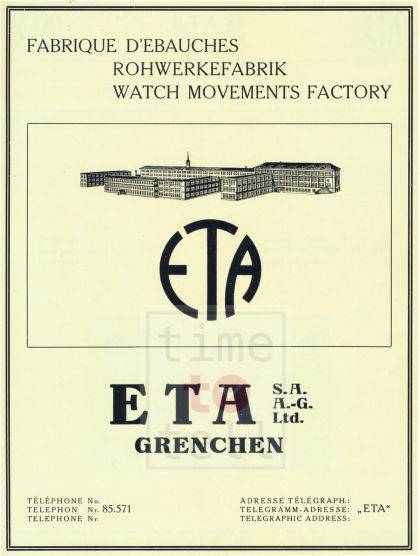 ETA, which is now part of the Swatch Group, is the largest manufacturer of watch movements, including mechanical movements, in Switzerland. Behind these somewhat terse three letters lie more evocative names such as Valjoux, Unitas and Peseux, hinting at ancient buried treasure whose riches will reward discovery.ETA was not made in a day. The birth of such an industrial conglomeration even required the intervention of the Swiss government itself. This fascinating history is strangely difficult to piece together. There are many documents telling part of the story, including some remarkable ones (see bibliography), but no complete history from the birth of Ebauche SA in 1926 to the Swatch Group of today.Up till now, that is. For it is this history I am inviting you to read. In it you will meet with hopes and fears, glittering successes and cowardly betrayals, something of the soul of Switzerland and so something of life itself. The watchmaker is by nature an individualist. Dug in at his workbench and immersed in his watchmaking, he hugs his secrets to himself and manages his business affairs alone. In fact, when a crisis occurred, as it did at the beginning of 1921, in order to get out of trouble each one sold his products for more or less miserable prices, by more or less legitimate ways. The behaviour that met with most condemnation was ‘chablonnage' – the export of ‘chablons' (the unassembled parts of a movement). This got round the proposed laws prohibiting the sale of Swiss movements outside the Confederation. Obviously ‘chablonnage' was unfair competition for the increasing numbers of makers of complete watches, the famous ‘Manufactures,' who, at the beginning of the 20th century, had started marketing watches under their own brand names, such as Omega, Zénith, Longines, etc, etc. 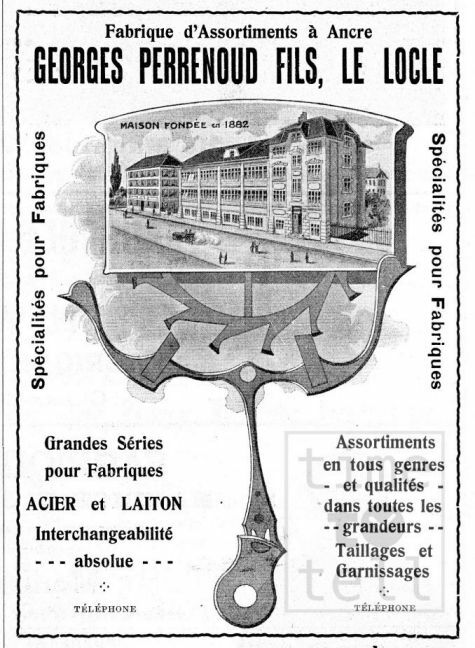 In 1924, in an attempt to introduce some discipline into the profession, these makers created the Fédération Suisse des Associations de Fabricants d’Horlogerie, better known under the abbreviation FH, who then sought to put a strategy in place. But the situation was complex. The crux of the problem was the movement, that renowned Swiss movement envied the world over. But this movement is made up of several parts. There is the movement blank, assembled by large companies with hundreds of employees. Then there are the pallets, the balance, the hairspring – all those tiny parts made by a multitude of small businesses, sometimes in just a simple workshop in the corner of a barn. The solution was to create the Union des Branches Annexes de l’Horlogerie or UBAH in 1927. The aim was to encourage self-discipline and to monitor prices and quality to avoid the exhausting cycles of price inflation followed by collapse. There was a bit of grumbling at first but the assurance of stable prices eventually won out. The UBAH became established in its own good time. However, it was a different ball game for the makers of movement blanks. These were the big boys. In January 1925, 26 movement blank makers tried to broker an agreement, but it was a wasted effort. A year later one of them unilaterally dropped its prices and the initiative fell apart. That’s when the banks were called in and authorisation given to the Société Anonyme Fiduciaire Suisse de Bâle. It should be noted that the Swiss banks were heavily implicated in financing the large movement blank makers and they had every incentive to promote market stability and so avoid the cold sweats of financial crises. Banks do not have a reputation for taking risks, but with a momentary stroke of genius they gave their support and thus on December 27th, 1926, Ebauches SA was created in Neuchâtel. Ebauches SA was born from the merger of three large movement blank manufacturers – Adolphe Michel SA. in Grenchen, created in 1898 by Adolphe Michel and Jean Schwarzentrub, Adolf Schild SA. also in Grenchen, created in 1896 by Adolf Schild-Hugi, and Fabrique d’Horlogerie de Fontainemelon, founded in 1793 by Isaac and David Benguerel in partnership with Julien and Francois Humbert-Droz. In the 1920s, these three factories produced more than 75% of Swiss movement blanks. Schild, for example, employed more than 2100 people. The secret of Ebauches SA is revealed in those last two initials: SA. It was not an association, nor a syndicate but a ‘Société Anonyme' – that is a Limited Company in private law and, backed by the banks, it was rich. Very rich. So when they invited you to dinner it was not to discuss conditions. Oh no! It was to talk takeover. And the small manufacturers of movements blanks surrendered one after the other. In 1927, nine makers were swallowed up, among them Hora, Sonceboz and Charles Hahn, the makers of the Landeron chronograph movements. In 1928, ten more went down, among them Felsa, Vénus, Racine, Bovet and Optima. In 1929, eight more, notably Postala and Urania. Now with strength in numbers, the makers signed the 'convention de chablonnage' on December 1st 1928 in Berne, which drastically regulated the rules and regulations in the matter of exports. But it was just a tad too soon. Considered of no account, the movement blank makers nicknamed ‘the dissidents' who had escaped the clutches of Ebauches SA had a field day and undercut the freed-up export market at their leisure. And to add insult to injury along came the great crash of 1930 and the United States, that champion of liberalism and principal export market for Swiss watches, raised its customs tariffs from 300% to 500%. The companies who had signed the convention were outraged at this unfair competition, the watchmakers' innate individualism reasserted itself and in December 1930 the conventions were terminated.